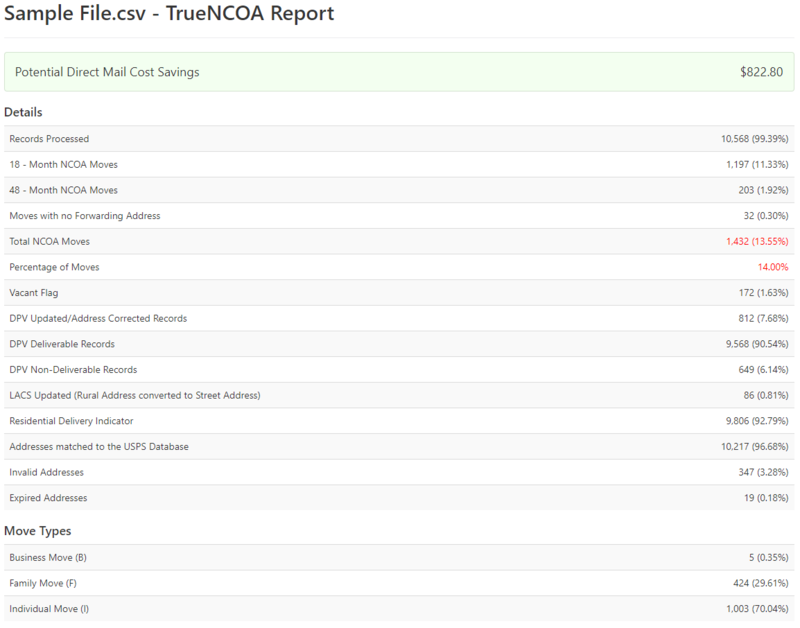 TrueNCOA was created to empower non-profits of all shapes and sizes to reap the benefits of NCOA. Our services help non-profits reduce wasted postage and keep their databases free of old, inaccurate addresses. Our $20 per file pricing is lowest and most affordable in the industry. Track moves and update addresses to ensure outreach and engagement efforts are as effective as possible. When a mail piece gets returned to your organization, it’s a drain on your time and resources. Someone has to review the mail, understand what went wrong, and correct the address in your database. On top of that, you’ve wasted postage, missed an engagement opportunity, and potentially lost contact with a donor. Discover additional address details like apartment number or street pre-direction to complete addresses and mail to previously unreachable individuals. NCOA services improve delivery rates in three important ways. First, they provide new addresses for moves within the last 48 months. Having an updated mailing address helps you ensure more of your mail pieces reach their recipient. Second, they identify other move data such as vacant addresses or invalid addresses, which helps you avoid sending mail to bad addresses. Third, NCOA standardizes all of your addresses to meet USPS mail standards. This makes it easier for the post office to deliver the mail. Identify duplicate donor records and addresses in your system to avoid unnecessary outreach and additional postage costs. Too much returned mail can result in fines from USPS. Using an NCOA service helps you meet the Move Update Standard, qualify for bulk mailing and non-profit discounts, and avoid unnecessary fines. Between wasted postage and penalties, an NCOA process can save you up to $0.44 per bad address!